Wolfgang Amadeus Mozart. Very Good. In very good packaging. Charles Mackerras-Mozart: Symphonies Nos. 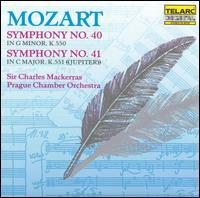 40 & 41 by Charles Mackerras. Very Good. First Release-1986 Telarc (CD-80139). Music CD. Disc in very good condition with minimal wear, plays perfectly. Case and inserts show signs of wear. Stored in sealed plastic protection. In the event of a problem we guarantee full refund. 2003. Music CD. Very Good. Very Good condition. Audio CD. Case Very Good. Booklet Very Good. Quality guaranteed! In original artwork/packaging unless otherwise noted.